Before purchasing our first travel trailer, we knew we needed to consider whether the weight and length of the trailer would work with our tow vehicle. Later, we came to realize there’s a lot more to it than that. Start reading about towing, and you’ll see a lot of unfamiliar acronyms, like CCC, GVW, UVW, GCWR, and more. 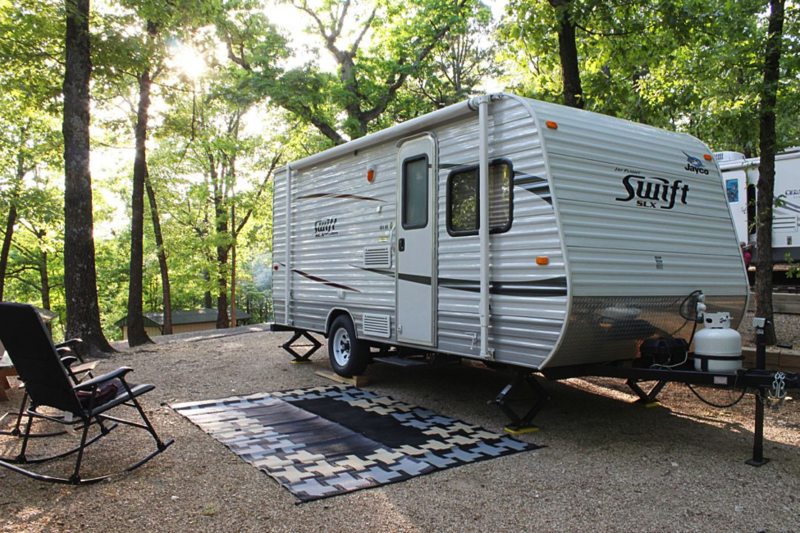 Before buying an RV, research the various weights and measurements you’ll need to understand to determine if you’ll have a good fit between the RV and your tow vehicle. When buying automobiles, I hop online and apply for financing if the dealership tries to saddle us with a high interest rate. I thought I’d be able to do the same thing when purchasing our travel trailer. Unfortunately, I learned that RV loans are different from automobile loans, and the process isn’t quite as easy or competitive. If you are looking to buy an RV, talk to your bank or credit union and look into specific companies that finance RV purchases before you make a deal. Since my husband’s tow vehicle had a hitch, I thought that was all we needed for pulling a trailer. We soon learned we would need to add a brake control system. This additional cost wasn’t included in my mental math as we made the purchase. Since we had not scheduled the installation of it before buying our trailer, we weren’t able to drive off with our new RV after we purchased it. If you are buying an RV, calculate items like brake control, weight distribution hitches, and sway bars into your expenses. As we toured RVs in our size range, we were mostly looking at floor plans and aesthetics. I didn’t think about technical aspects like tank size. The size of our black tank and gray tank prevents us from spending much time without full hookups. Before buying an RV, think about what kinds of camping situations you’ll prefer. If you want to spend time off the grid, you’ll need to understand your tank size needs. My in-laws owned every type of RV from a pop-up to a Class A, which allowed us to see the pros and cons of each type. We went in with a good idea of what we wanted in a trailer, but we didn’t think far enough into the future. We bought a trailer that fit the needs of our family today. It’s good to think a couple of years ahead so you won’t have to upgrade your RV too quickly after purchasing it. Ultimately, we purchased a great travel trailer, despite our lack of knowledge. However, the process would have gone more smoothly if we had understood the intricacies of buying our first RV. After making our purchase, it wasn’t long before we hit the road and began having adventures as a family. Also important: Discovering the universe of benefits, services and savings available through the Good Sam Club. When it comes to your next purchase, visit the nearest Camping World SuperCenter, or drop by one of the RV and Camping shows near you.